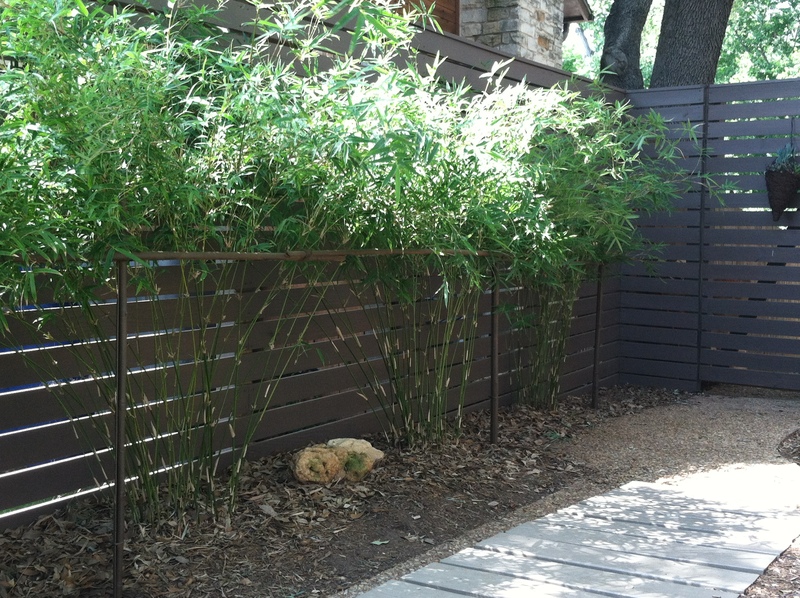 Last spring, May 2012, we added five bamboo plants, Bambusa multiplex Featherleaf, along our fence line. This variety is the clumping type (no aggressive rhymezone runners) for easy control near the property line; it takes zone 8b afternoon sun; it reaches twelve feet maximum height- so not a height that will dominate our urban pie-shaped lot. After a year with the Featherleaf bamboo, I appreciate how it sways and rustles in the wind and admire how the slender leaves brightly glow in the sunlight. 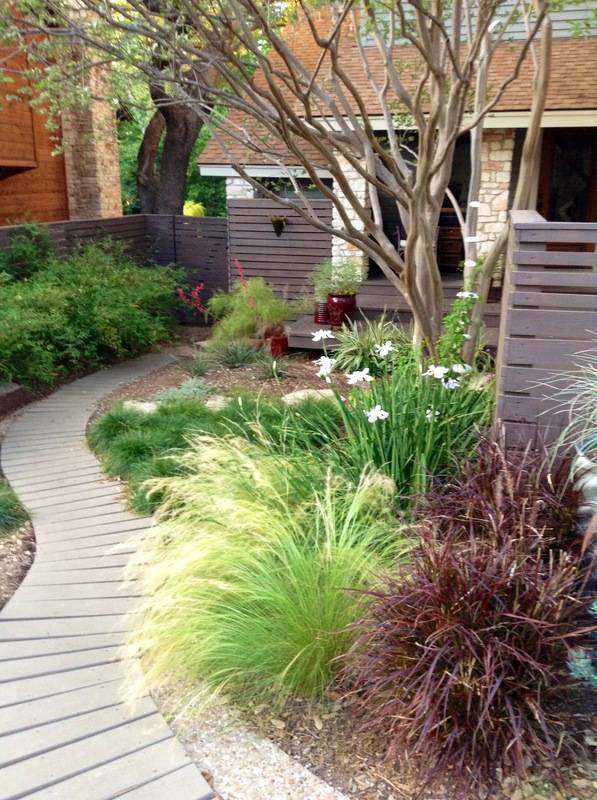 A negative, in a narrow space at least, is its fine culms that tend to arch out as opposed to the larger, straight and erect culms often seen in narrow bamboo hedges. 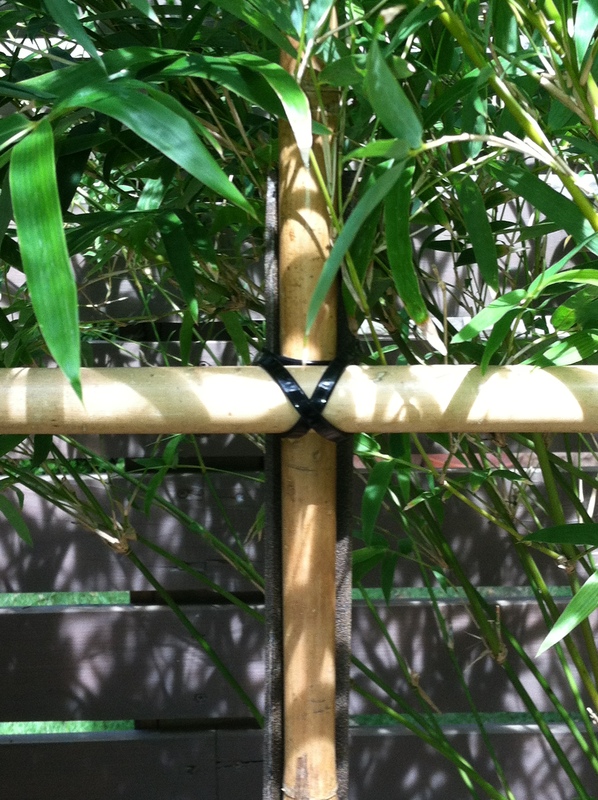 This drooping habit is common in clumping bamboos that can take sun. As expected, it grew minimally in height its first year, but it filled out considerably, and its natural tendency to arch began to block the adjacent pathway. 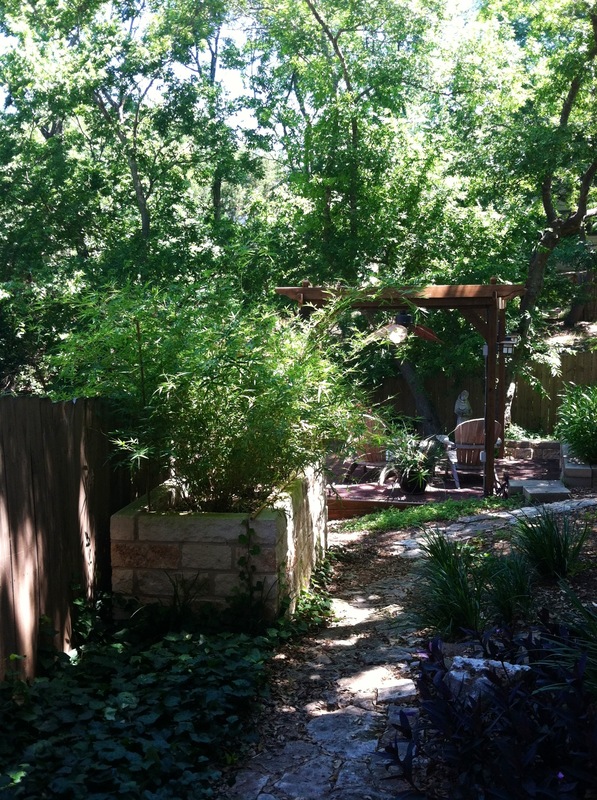 The left side of this image shows the bamboo encroaching on the often walked plank path. After a recent nice long rain, it flopped completely onto the path. 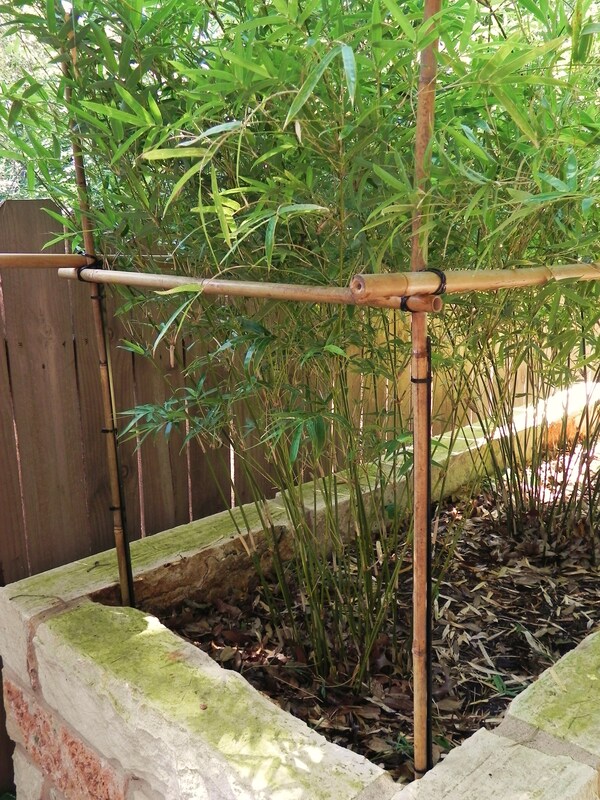 I knew when they were planted that they’d eventually need corralling to work in the slim space, and I had planned to use an idea I’d seen on the Digging blog featuring a Houston garden where bamboo was secured to a fence. It turned out that this was not a good option for us, so I came up with a similar non-fussy and inexpensive solution. I’m very happy with its form, function and low-cost. My husband appreciated how light the materials were and how quickly this solution came together. The structure was built using…. 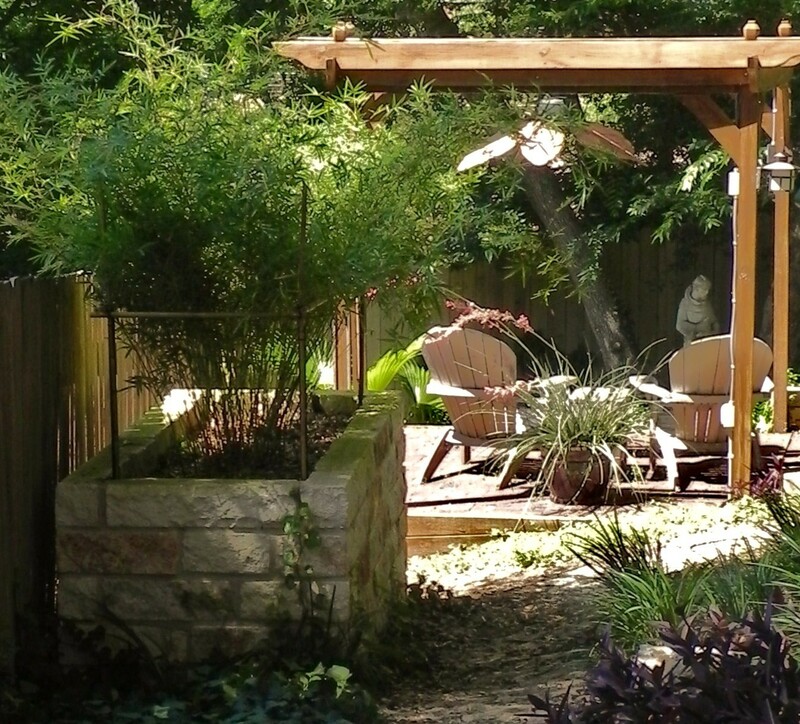 To install, we hammered the stakes in as posts, then attached bamboo poles to the front side of the stakes using zip-ties to “pretty them up”. This gives the illusion of light and organic but with the strength and rigidity of steel. The horizontal poles were then added by criss-crossing zip-ties. Horizontal poles attached with zip-ties in a criss-cross lashing fashion. It was an after thought to spray paint it to blend with the fence color. This gives the illusion that perhaps the lashings are something other than zip-ties (above) and helps the 15′ long structure be less visibly prominent (below). 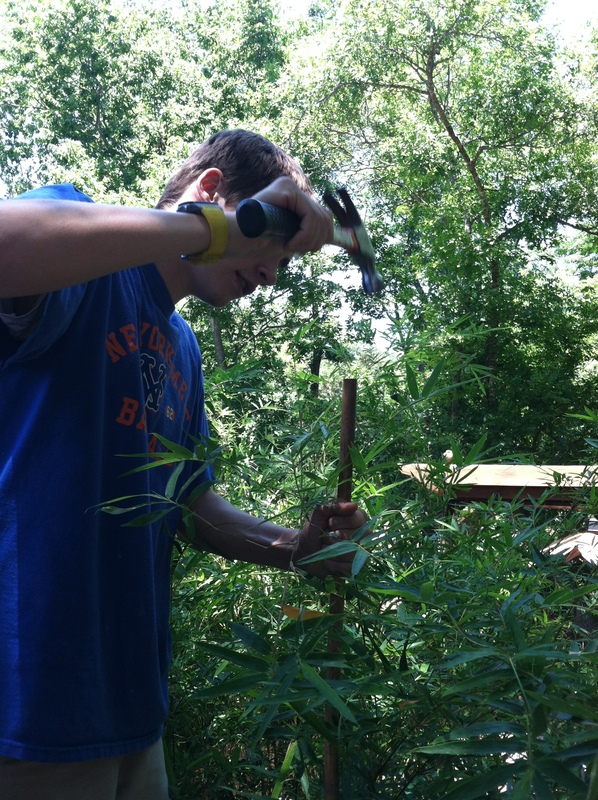 The plants were also pruned in a manner that is called “legging up” bamboo: the oldest and thinnest culms were removed from the center, and the secondary side growth was removed from the remaining culms so the foliage seems to float above bare lower culms. 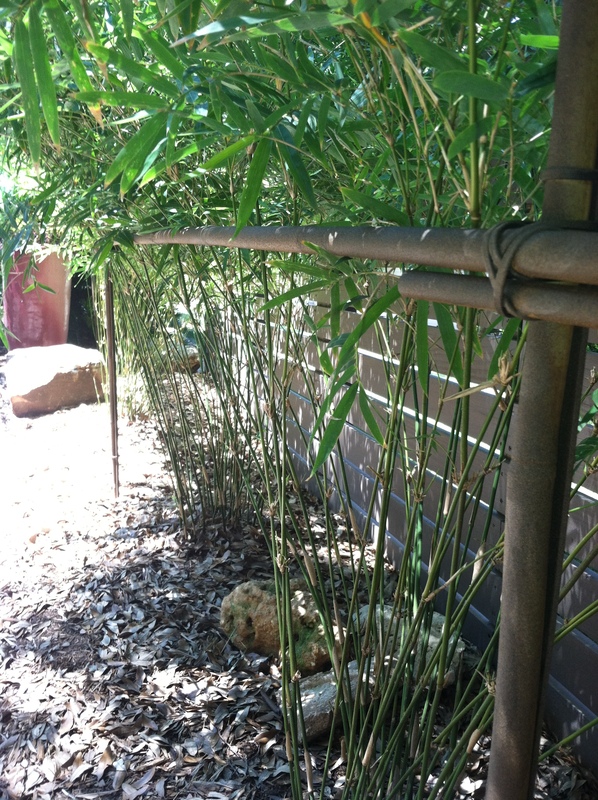 My son then worked to add the same support to the new bamboo that swatted our faces each time we passed the backyard stone planters. Same support structure made in a square. Extra height was left at the corner posts so that higher horizontal supports can be added as the plants get taller.